Celebration about The High Chaparral Season I DVD release from ART-S in the Netherlands came a little early for a few U.S. fans. Although many have purchased the digitally re mastered release and are happily watching, a handful report problems playing the European based release on their home DVD players. Art-S owner Rob Art confirmed the DVD set is region free, but in the European PAL format. Order from The High Chaparral Reunion for peace of mind - if your DVD player can't handle the PAL format, we'll refund your money, including postage! Many U.S. DVD players accept and play back both PAL (European) and NTSC (U.S.) format disks. Older or cheaper models may not. The easiest way to determine if yours does is to check the user's manual, and if you no longer have it (who keeps all that documentation?) do a search on the internet with your player manufacturer, model number, and the words 'PAL' and 'NTSC'. If your player is unlucky and you want to upgrade, all-region, all-format DVD players can be purchased for less than $50. 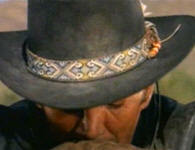 The High Chaparral Reunion recommends the experts at World-Import.com. You can call them to discuss your concerns if you have questions and they guarantee their players. Another benefit to upgrading is once you have the all-region/all-format player, you can purchase DVDs from any source. Have you wanted the Season I release but had trouble negotiating German or Dutch? 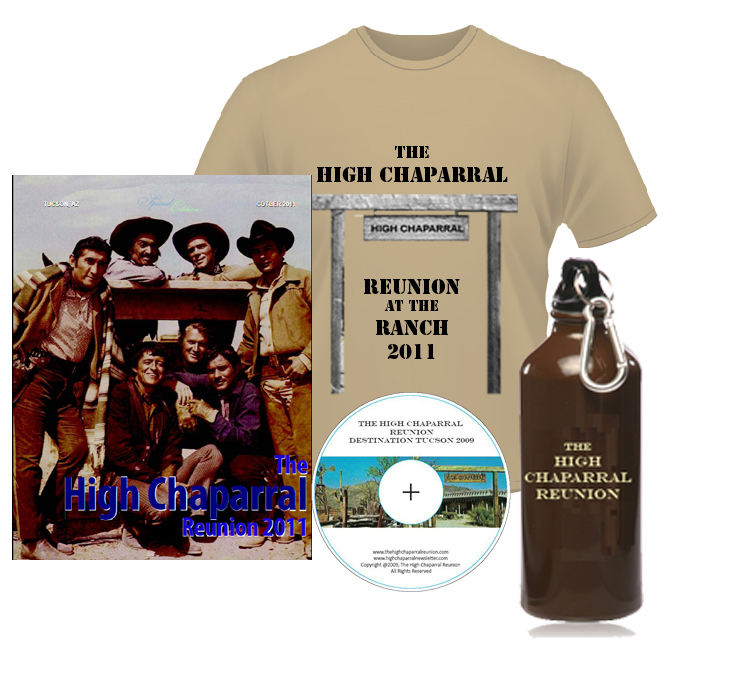 Now you can order in English with your Credit Card or Paypal from The High Chaparral Reunion. 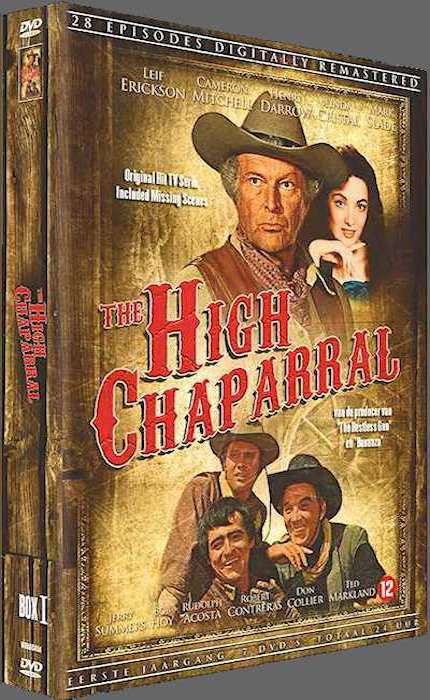 Plus our wonderful fans who Sponsor and become an essential part of the Reunion at the $165 level receive the ART-S authorized Season I DVD release of The High Chaparral. This digitally re mastered, uncut, crystal-clear DVD release contains the complete and original pilot movie along with ALL season I episodes. Sponsorship with Season I DVD is $165.00 USD, plus shipping. Regular sponsorship is $100. An original 2013 HC Reunion invitation with the original artwork of Patricia Schantz. We can't possibly say it enough - thank you to everyone who helps make the Reunion possible. DVD's are available for sale separately. Art-S plans to release Season 2 later this year. Note we've had a couple of individuals who've had difficulty playing the Art-S DVD with their player. Should you purchase the set and have any issues we'll refund your payment including postage. Rudy Ramos is one of the few performers today we can honestly call "a star of stage, screen, and TV" (and don't forget music). 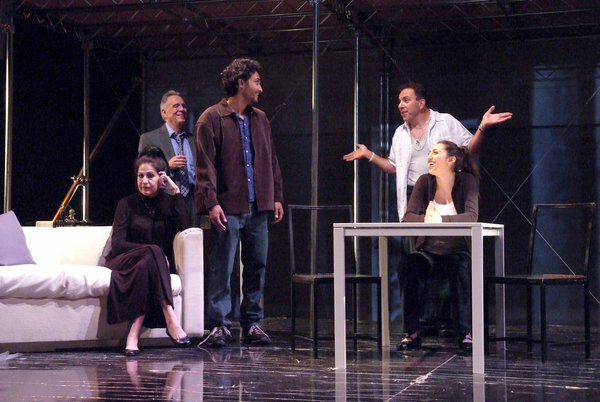 Rudy recently performed in the Latino Theater Company's drama Charity: Part III of a Mexican Trilogy at the L.A. Theatre Center. 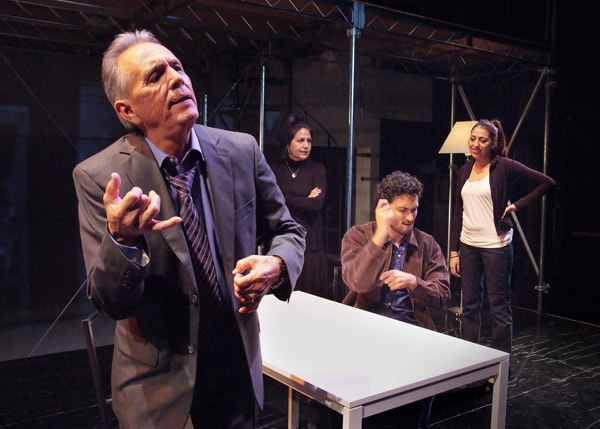 Written by Evelina Fernandez, the three plays concern three generations of a Chicano's family quest for the American dream. Rudy's performance was described by critics as having " unforeseen flashes of raw potency." Congratulations to Rudy on another stellar theatrical achievement. 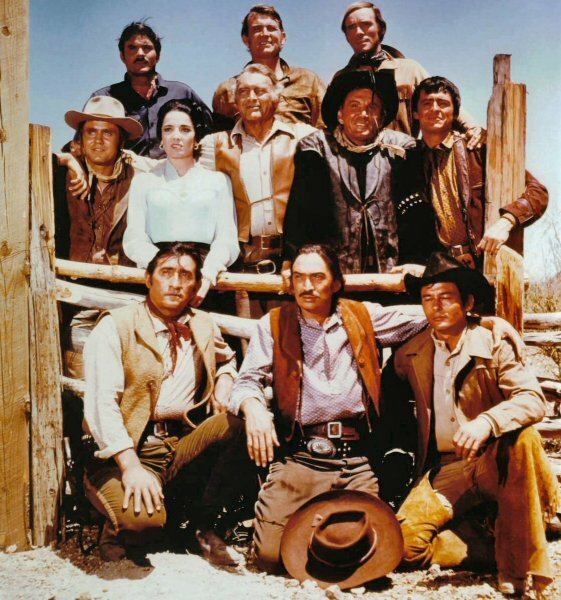 Have you attended a past High Chaparral Reunion? Then you definitely want to attend the 2013 event - it marks the 10 year anniversary of High Chaparral Reunions! We've got something very special planned for all Reunion Alumni that you absolutely won't want to miss. Be sure to mark your registration as 'Reunion Alumni' when you sign up....and don't forget to sign up soon at the Early Bird Rate. You definitely want to join everyone else and attend the 2013 Reunion! 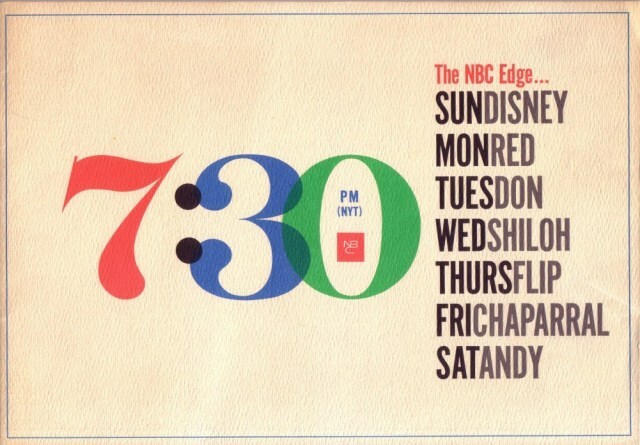 Vintage NBC advertisement for their nightly 7:30 line-up, featuring The High Chaparral on Friday. 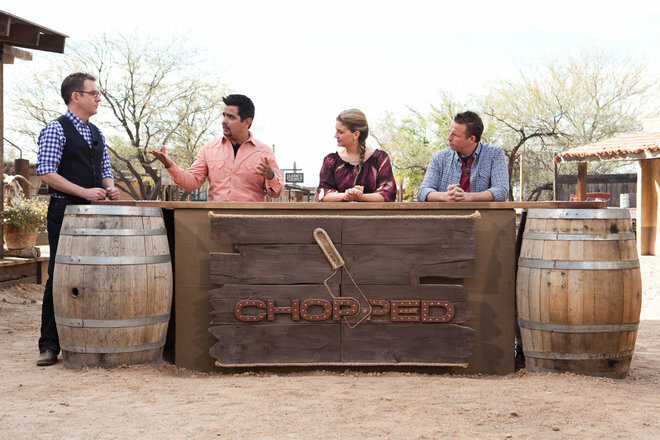 The Food Network traveled to the Arizona desert for a special five-part themed Chopped: Grill Masters premiering Sunday, July 22nd at 10pm ET/PT. Over five-weeks based outside at the nostalgic Old Tucson Studios, sixteen grilling professionals from around the country face off in this captivating Wild West showdown. The stage is set for the ultimate culinary feud with Chopped favorites Amanda Freitag, Marc Murphy and Aarón Sánchez at the judging table, and astonishing mystery ingredients and tremendously talented competitors. One chef from each preceding duel makes it to the final fiery face-off, and when the dust clears, the greatest grilling pro of all walks away with a $50,000 grand prize. High Chaparral fans will recognize Old Tucson in the July 22 premier that starts a fierce, five-part showdown for a $50,000 grand prize. In the appetizer round, the first four grill masters are faced with preparing a dish using cookies and yak steaks. Then, a giant surprise awaits the competitors in the entrée basket, and in the dessert duel, chocolate meets fruit for a showdown. In addition to ongoing and special exhibitions, the Autry continues to provide a wide range of programs, special activities, and events designed for a variety of interests and all ages. In addition to Henry's book signing on Sept 15, there are additional activities scheduled including the Autry Farmers Market, Highlights from the Southwest Museum of the American Indian Collection, Gold Rush family activity, and Latino Heritage Month Book Talk: LATINOS IN LOTUSLAND. The Autry is an ideal location for Western heritage fans to meet Henry and get a personally signed copy of his book. Special Thank You to Jean Graham for sending this and several other pieces of memorabilia to share with other High Chaparral fans. In his "Pensees," Blaise Pascal, the French scientist and religious philosopher, said, "What a chimera then is man! What a novelty! What a monster, what a chaos, what a contradiction, what a prodigy!" Which, in relation to Cameron Mitchell, isn't as far-fetched as you might think. For instance, Mitchell admits that he has been called almost everything in the book. Maybe not a chimera, but any of Pascal's other words might well apply to him -- plus a few more. It has been said that he is "an outspoken, hard-headed guy who has fought with all his High Chaparral colleagues and who manages to alienate just about everybody who runs into him, from fans to producers." Here again Mitchell readily admits, "Everybody on the show hates me, except David Dortort. Maybe hate is too strong a word. But I think they all respect the truth of what I say." 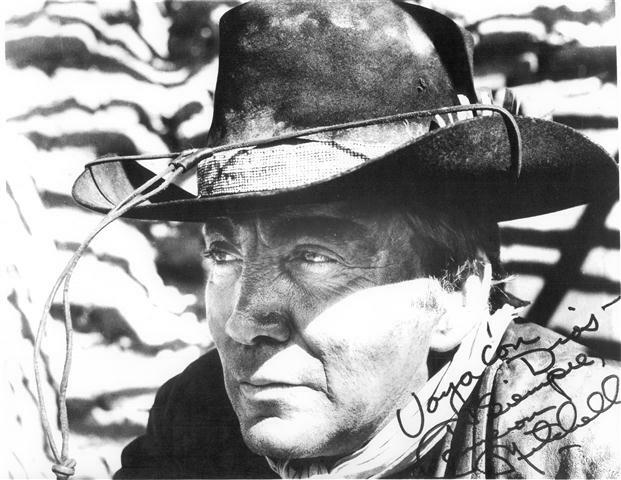 Dortort, executive=producer of The High Chaparral, denies any dissension in the ranks of his stars, co-stars, guest stars and special guest stars. "They're just like one big family," he says. But a few years ago he was saying the same thing about Bonanza at a time when Pernell Roberts, the prodigal Cartwright, was sounding off in quite another way. 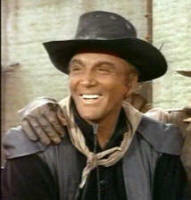 It is true, though, that relations among the members of High Chaparral's big cast seem friendly enough. When they come to advance screenings at the studio, they bring their wives and children, there are cheery greetings all round, and something like a family picnic atmosphere prevails. So far, only one real "incident" has been reported -- between Leif Erickson and Cameron Mitchell on location in the 120-degree desert heat near Tucson -- and that was talked out and settled amicably. Probably the 49-year-old Mitchell did most of the talking. He has acknowledged that one of his major faults is that he is a marathon talker. Although his language may become strong on occasion, his conversation is laced with more religious quotations and references -- from the Bible to Zen Buddhism -- than with profanity or vulgarity. His preoccupation with religion is great. He says, "If you can't believe there's something more to life than the stink of man, there's nothing." Once he flew from Miami to Nassau when he heard about a "miracle" in a church there. He comes by this interest naturally. His background is theological rather than theatrical. Born in a rural, Pennsylvania Dutch community, Cameron Mitzell -- his real name -- was one of seven children of a minister. As a child during the depression, he wore his sisters' hand-me-down shoes and coats to school. But it was while he was in school that he first became interested in acting. Once, in a church pageant, his pants fell down. "I must admit that I rather enjoyed the laughter," he says. Later, when he was in high school, one of his teachers, convinced of his acting talent, lent him money to go to New York to dramatic school. "When I got to New York I had never ridden in an elevator or used a telephone," say Mitchell. But he did know how to write letters, and write letters he did -- to producers, actors and agents -- while holding down jobs like ushering, washing dishes, being a mail clerk and a guide at Radio City. None of his hundreds of letters even got a reply until he wrote a particularly brash one to Alfred Lunt, criticizing his performance in the motion picture "The Guardsman." Lunt replied and gave him a chance to audition. Afterward, when he tried to apologize for his letter, Lynn Fontanne said, "Don't worry about what you've done. Acting is your life's work, and you're not only going to be a good actor, you're going to be a great actor." She also suggested that he change his name from Mitzell to Mitchell. The newly baptized Mitchell worked with the Lunts ("the greatest training in the world" until he joined the Air Corps in 1942. ("I don't like to talk about that. I was a lousy bombardier -- I never hit anything". Meanwhile, in 1940, he had married actress Johanna Mendel. "The marriage lasted until 1960, when an acrimonious divorce ended it. Possibly Mitchell's talents as an actor, as appraised by Lynn Fontanne, have been a handicap rather than an asset during his 30-year career. Despite appearances in many top box-office films -- from "Death of a Salesman," in which he repeated his Broadway role, to the voice of Christ in "The Robe" -- he has never really made it big. The reason undoubtedly is that, unlike the Gables and Bogarts and Grants, he projects no image of his own. "Nobody ever knew me as Cameron Mitchell -- I become the character," he says. Although he is contemptuous of Method actors ("You can't be somebody else, because you're you"), he completely immerses himself in each part he plays. Once he became carried away during a scene and choked another actor so hard that shooting had to be stopped and the two forcibly separated. When he appeared as an Indian in "Pony Soldier" with Tyrone Power, his own parents did not recognize him when they saw the picture. He says, "This may be nice artistically, but not financially." In just one season of High Chaparral, Mitchell has probably become more identifiable to the public than in anything he has ever done, and if the show continues indefinitely, a la Bonanza, he may become as much an uncle-figure as Lorne Greene is a father-figure. After an up-and-down career in Hollywood movies and on the stage, Mitchell went to Europe in 1956 and acted in a series of generally undistinguished films there, including 30 made behind the Iron Curtain. On a trip to South Africa, he got the sort of mass adulation he had never received before. "I was almost mobbed when I went into the black compound," he says. "All those lousy movies I made in Europe were the only ones those poor people could afford to see. I was a big star to them." On another trip two years ago, en route to Madrid, he ran into David Dortort, who had once produced a television version of "The Ox-Bow Incident," in which Mitchell appeared. Dortort asked him if he would like to do a TV series. Mitchell's immediate reaction was negative -- his appearance in an earlier series, Beachcomber, had not been happy, and he liked living in Europe. But his second wife, Lissa -- a blonde dancer he had met while doing the movie "Carousel" -- said that she wanted to come back to the United States. "Our older son, Buttons, learned to speak Italian before he could speak English," she says. 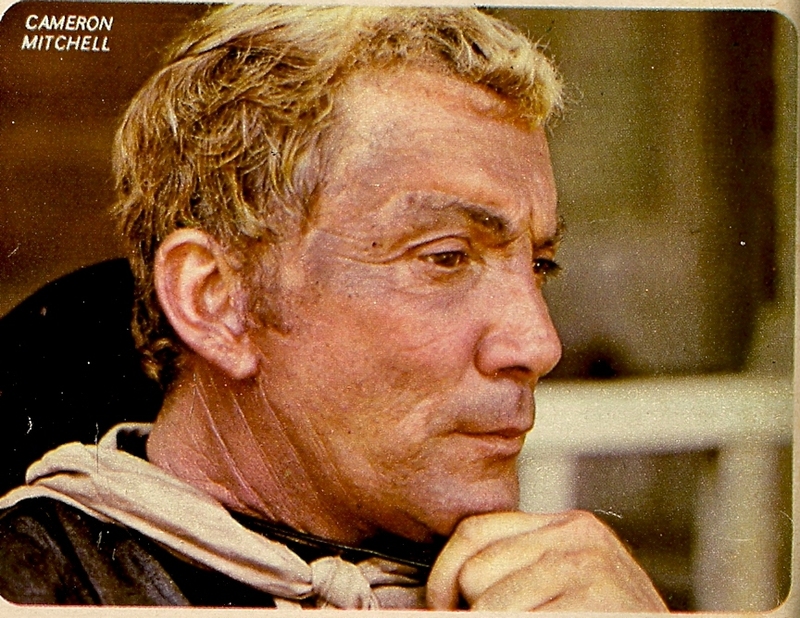 Mitchell took the role of Buck Cannon in The High Chaparral. Today, the Mitchells and their two-small-children-going-on-three live in a modest home in Pacific Palisades, Cal. The actor is proud of the children from his first marriage, now in their teens and 20's. And he speaks affectionately of his first wife. "We get along better now than we ever did when we were married." he says. She lives in Vancouver, B.C., which may have something to do with it. The Mitchells rarely socialize and when they do, it is not with actors. Says Cameron, "I like Angelo, the guy that runs the little Italian restaurant, better than any actor I ever met." (Mitchell has a prodigious appetite, by the way, and for breakfast will have chicken noodle soup, calf's liver and onions, and mashed potatoes with gravy. He also enjoys the company of athletes. "There's nothing phony with them -- they have to produce," he says. "Their tongues can't do it, and a press agent can't do it. It's closer to Zen than anything I know." Mitchell has a disconcerting habit of throwing in bits of philosophy, such as the Zen reference, with his ordinary conversation. but, philosophizing aside, his major preoccupation is golf. He has, literally, hundreds of clubs at home and abroad, many of his own design and making -- his putter, for instance, is made from an old driver with a five-pound lead weight taped to the top. Despite a painful arthritic condition in his arms and back, he plays golf every day The High Chaparral is not shooting and every chance he gets when it is. He says, "If I had enough money, I'd buy an island -- with a golf course." Which brings up the contradiction in Cameron Mitchell. someone who knows him says, "He likes to revel in the glory like any actor." But Mitchell, with an intensity characteristic of him, says, "I shouldn't have been an actor. But now I don't know anything else, and I have to make a living. I hate conceit, and I hate vanity -- what does the Bible say? 'All is vanity.' I'm in the worst business in the world." 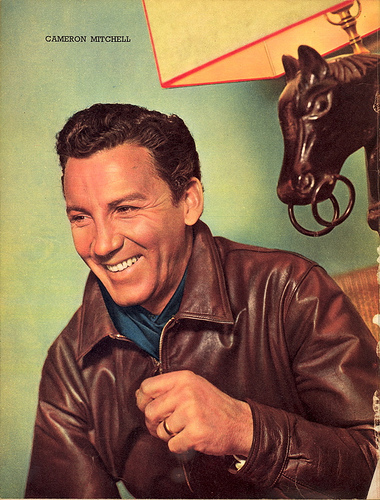 Also characteristically, though, he can take an almost mystical view of his role in The High Chaparral: "Here in Hollywood, it's another Bonanza, but just alone out there in the desert, you have a feeling you're doing something that really happened to somebody 100 years ago." Of Cameron Mitchell the late Hedda Hopper once wrote, "He isn't handsome. He isn't one of the lucky-break boys or the overnight flashes." He certainly isn't. Since the Lunts first saw his promise, he has been at it a long time. As for his looks, what would pass for a bad nose job with any other actor is the result of his nose having been broken five times. Despite his philosophizing, which can sometimes become pretentious ("We make a world of duality that doesn't exist"), he is basically a down-to-earth, rough-hewn person, whose roots are still back in rural Pennsylvania. Yet he has enough of the actor's vanity, no matter his claims to the contrary, to read aloud a Variety review that one of his Italian movies was "sleeper of the year," But he includes the reviewer's note that it has "poor marquee value" and adds, "that's me." A novelty? A monster? A chaos? A contradiction? A prodigy? Cameron Mitchell, in one way or another, seems to be all of them. 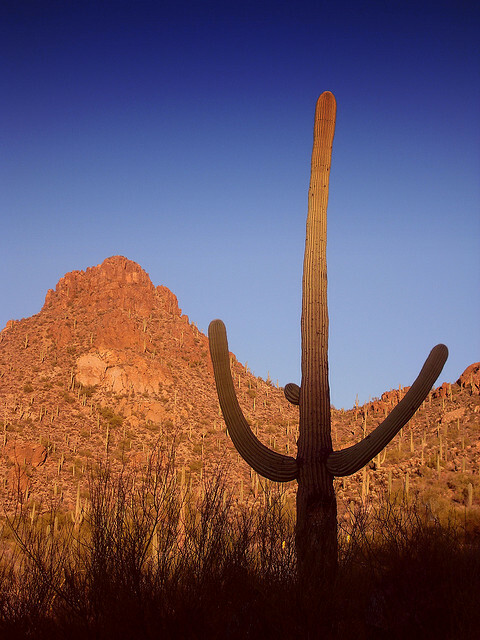 The first article I ever wrote for High Chaparral Newsletter was about the majestic saguaro cactus so it seems appropriate that as I pass my third anniversary of writing for you, that I go back to the beginning – sort of. Rather than write about cactus, I want to tell you about bats of the Chaparral. Despite the wonderful atmosphere they can add to a horror movie bats are important animals, especially if you’re a cactus. They are the major pollinators of cactus and the Chaparral’s saguaro depends on them. Doves and bees are also important daytime pollinators though the bats do the bulk of the pollinating and they do it at night. It’s their other job for when they’re not playing supporting roles in horror movies. Bella Lugosi sure knew how to use a bat in films. But he seemed to be one of the few who did. Taking their cue from Bella, other horror film producers adopted the animal which is probably why bats have such a stigma attached to them. Think bat, think blood sucking monster, favorite of vampires and witches, their wings apparently being a popular ingredient in potions. And yet they were, and still are, an important player in The Old West. I find it interesting that we often see night scenes on the Chaparral with silhouettes of saguaro dotting the landscape (not that they can go anywhere) but we never see bats cross the night skies. We have bats in our neighborhood and most nights if I take the time to look, I can see them taking flight at dusk or returning before dawn. It’s a given that if I am out at that time, my eyes always look skyward for them. So naturally, I do the same when I watch dusk and dawn scenes on High Chaparral. Mano’s guitar melodies drift off into the night but the bats don’t seem to be around to hear them. I have yet to see one. But maybe I keep missing them so take note next time it is dawn, dusk or even the middle at the night at the Chaparral. Saguaros are not self fertilizing and are, in science terms, self incompatible. This means they require fertilization from an outside source. The outside source carries pollen from one plant to another. This happens when the pollen dust sticks to the feathers or fur of an animal coming to drink the flower’s nectar. While poking about in the flower, the pollen sticks to the animal whereupon it is brushed off on the next plant the animal visits – and more is collected. There are 28 species of bat found in Arizona but the lesser long-nosed bat is the major pollinator of the saguaro. If you want a real mouthful, their scientific name is Leptonycteris yerbabuenae (try saying that after you’ve had a few drinks). The bats are colored yellow-brown to gray with rust colored fur on their belly. They are one of the few bat species that undergo migrations in search of food. Because bats are nocturnal, the cactus has evolved to take advantage of this. Consequently, saguaros are night bloomers. However, their flowers do remain open part of the day so birds and bees do the pollinating then. But their perfume is only released at night. Since bats are the heaviest animals to come into contact with the flowers, saguaros have evolved to grow flowers that are strong enough to hold their weight. Consequently, the bees and birds have no problem with flowers collapsing on them when they visit. 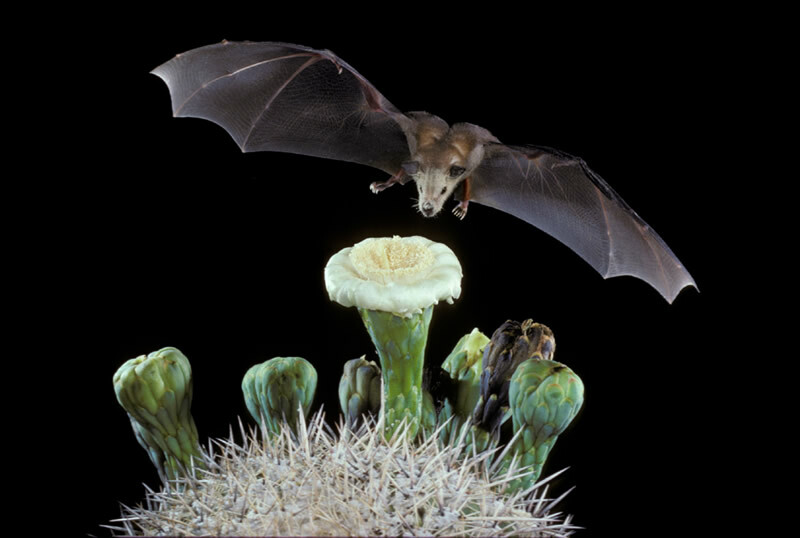 While birds and bees also visit the flowers, the most important relationship is between bat and cactus. The bat needs the cactus as much as the cactus needs the bat. 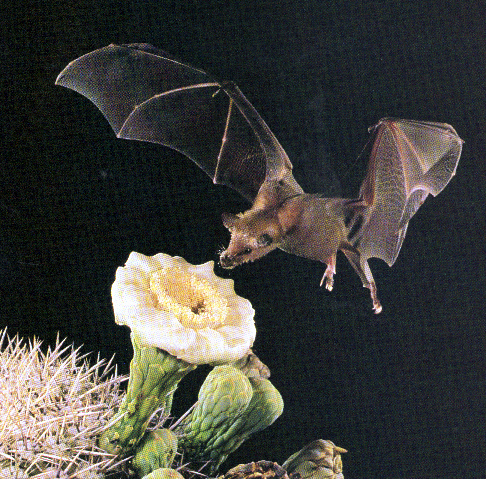 Cactus flowers are a major food source for the bats. The lesser long-nosed bat is an endangered species, often killed when it is mistaken for the vampire bat* though I don’t see how people can confuse them. The lesser long-nosed is much prettier, for a start. If you don’t believe me, do an internet image search for the two bat species and see for yourself. The poor little vampire bat was short changed in the ‘cuteness’ department though I find them adorable as babies. The lesser long-nosed bat undergoes major migrations in search of the rich nectar saguaros produce. Like us, bats are mammals therefore they feed their young on milk. In addition to providing a food source, evidence suggests that the amino acids found in the pollen help to sustain lactation in bats. I find this an important fact but even if you aren’t into bats, consider their importance to cactus pollination if you are ever tempted to harm or even be critical of them. There is beauty in all creatures. For some people, it just takes a bit more thought to find it in bats but it’s there. Another of the 28 species known to pollinate cactus plants is the pallid bat (Antrozous pallidus). The pallid bat is one of only two known bat species to be immune to scorpion venom. Like most bat species, the gorgeous little creature gives new meaning to the name ‘Big Ears’. Enid Blyton’s famous brownie would surely love them.